When people think about traveling to Thailand, they may think of the beautiful beaches, extravagant temples, the abundance of street food, or of elephants. The allure of getting close to elephants draws many to Thailand including us. We traveled north to Chiang Mai specifically for an elephant experience. We were aware of "phajaan," the torture inflicted on elephants to control and train them for rides and work. If you are not quite sure about the brutality elephants endure so you can ride them read One Green Planet's article for some saddening facts. As animal lovers, we opted for what seemed a more humane option, an elephant sanctuary. 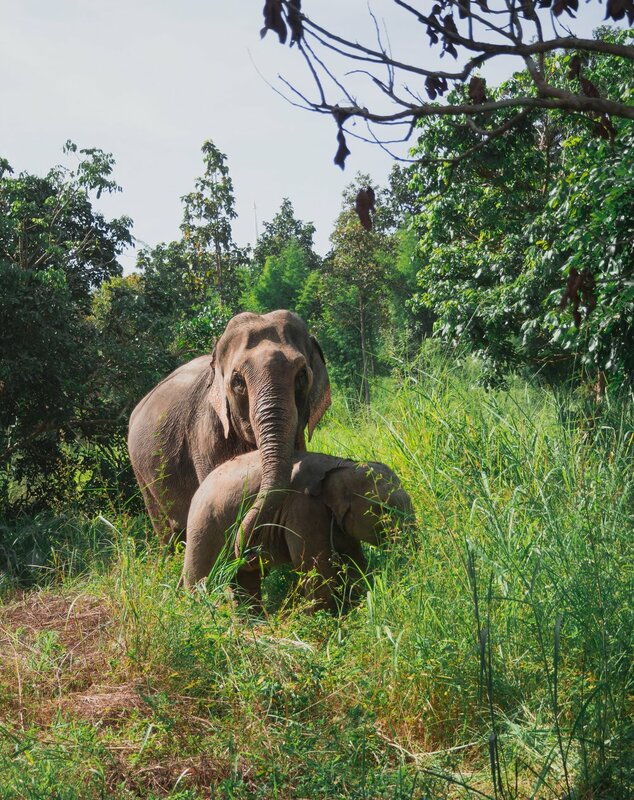 After doing some research at 248 Street Hostel, the owner Bam helped us pick a Maerim Elephant Sanctuary where the elephants are permanent residents, retired from riding and logging camp, and are not subject to bullhooks. Mostly, the whole day is filled with watching elephants be elephants - up close and personal. Sanctuaries are supposed to be a haven for elephants to live the rest of their lives in peace. Or at least that is what we believed. What spurred me to write this article was the fantastic time I experienced and the intense observation I made of the interactions and treatment of the elephants. The more I questioned the ethicality, truthfulness, and sustainability of the sanctuary, the more I felt guilty for paying for the experience. Brenden and I decided elephant "sanctuaries" are not sanctuaries at all and for a variety of reasons are just glorified petting zoos exploiting already tame, broken, abused elephants for profit. Once we arrived, we sat down and watched a video showcasing the inhumane treatment captive elephants receive. When the video was over our guide was quick to explain why sanctuaries are better for elephants. By highlighting the gross reality of elephants in forced labor camps, sanctuaries in comparison are safe havens. Tourists can feel assured they made the right choice attending a sanctuary instead of riding an elephant. Now I am not entirely disagreeing - sanctuaries are better than forced labor, but at the end of the day captivity is captivity. During our day at the elephant sanctuary, we were led to believe that the sanctuary is non-profit. Our guide stated all of the money earned went right back into the elephants. The amount of space the elephants had and the state of the facility said otherwise. Half day tickets to Maerim Elephant sanctuary are 1,500 baht. Full day tickets are 2,000 baht. There are two half day tours and one full day tour in a day. The sanctuary is open seven days a week. We approximate an average of ten people in each half day tour and five people in the full day tour. With quick math, we calculated the Maerim Elephant Sanctuary earns 40,000 baht a day and 14.6 million baht a year. We highly doubt that an average of 14.6 million baht is being put directly back into the elephant's welfare and the upkeep of the facilities. Six elephants live on less than two acres of land, the tours are run mostly on volunteer guides, and the facilities are a bare minimum. Our guide also mentioned the sanctuary is only two years old and in the time purchased approximately five more acres of land and saved three elephants in the past year. Initially, I was delighted, but now I see the immense growth of the sanctuary points to its high profitability. What makes this worse is at the end of the day, the guide points to a large sign asking for donations for an elephant named "Chock-Dee." 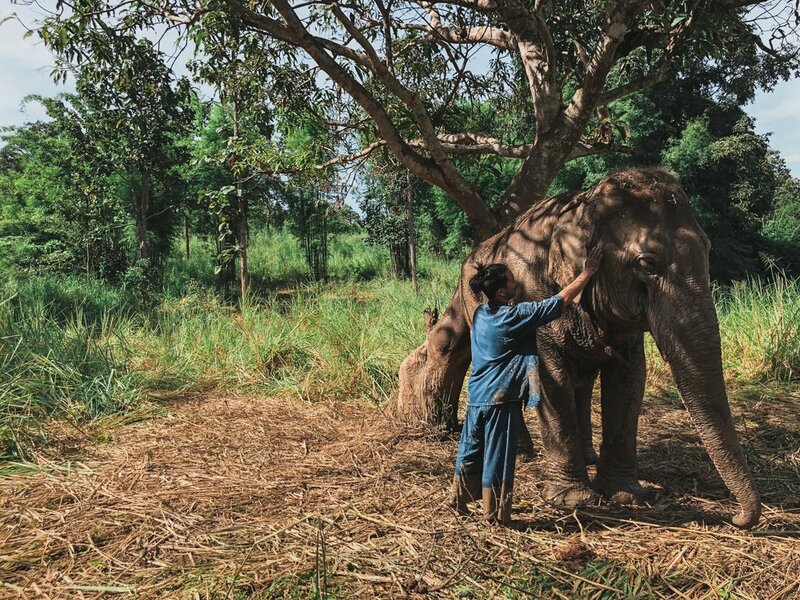 A 40-year-old elephant in a riding camp they want to rescue, but costs 1.5 million baht to purchase. The staff asks for donations to help them save Chock-Dee. If the sanctuary makes 14.6 million baht a year, what is stopping them from already purchasing Chock-Dee? Why ask for donations if they make enough profit from tourists? I will admit I was suckered at the plight of this poor elephant and wanted to help. I donated 100 baht in the effort to save Chock-Dee. I'm sure now the 100 baht won't go to saving her. I initially thought Maerim sanctuary rehabilitated sick and abused elephants. Most elephants in camps only have abusive relationships with humans and as a result are aggressive around people - hence the use of the bullhook. I was under the impression there would be rescued elephants that could not interact with people as well as docile elephants. On the contrary, all the elephants at the sanctuary are tame. These elephants are comfortable around people and don't mind if you pet and hug their trunks. Human interactions bring in profit so why would a sanctuary bother with elephants that could not interact with people? They wouldn't. The lack of elephants that need true rehabilitation and care prove sanctuaries which claim to exist for the benefit of tortured elephants are merely exploiting them for profit. Sanctuaries preach no hook methods to control their elephants. Though we did not see any hooks used, there were moments that I felt the animals were still abused. One of the newer elephants named Freedom is from a logging camp and is not social. During our day she headbutted another elephant at the mud pit. After the headbutt I caught a glimpse of her mahout (trainer) pinch her hard on the back of the leg, and she let out a loud shriek. I realize now it may have been a small handheld prod. Another moment during our walk, one elephant ate bamboo out of the neighbor's yard. 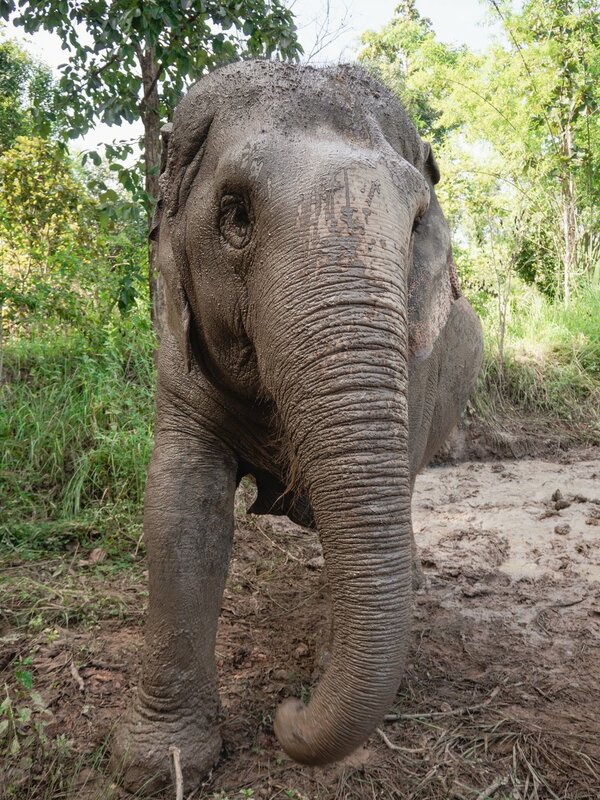 The mahouts aggressively tried to stop the elephant while she let out shrieks and trumpets. You can listen for yourself in our video. Whenever the elephants started to trumpet, arc their trunks up, or back up (which we learned are signs of distress or discomfort), the mahouts were quick to yell, finger poke, or pull on the elephant's ears. If elephant sanctuaries are profiting from tame interactions with humans, then it makes sense they want to keep their elephants docile during day tours, even discreetly. The elephants also wear large rope collars around their necks for the mahout's control. After more research, we think the ropes are also used to chain up the elephants at night. The mahouts also have elephants do tricks during the tour like spray water out of their trunks or lie down in the watering hole for tourists to wash them. The acts made us uncomfortable because we thought about what the elephant had to endure to learn tricks. What happens if the elephant fails to do the trick during the tour? I asked if they planned on releasing any of their elephants back into the wild. I received a blunt, "no these elephants cannot go back." When I asked why my guide more or less said, "tame elephants would not integrate back into wild elephant herds." At initial glance, this answer makes sense, and I believed it. Elephants are complex emotional creatures and once removed from their heard may have challenges re-socializing with wild elephants. However, with some research, I quickly found the opposite was true. Elephants at sanctuaries will never be released back into the wild because elephants are an expensive investment for profit. Elephants in captivity attract tourists to open their wallets to come feed, walk, bathe, and take pictures with them. Sanctuaries convince tourists that these elephants are freed from their previous hell-like conditions and thus make tourists confident that investing in "safe" sanctuaries is money well spent. None of which is beneficial to the welfare of the elephants. Wild Reserves are the Only True Elephant Sanctuaries. Our wallets have immense power. If we continue to invest in the sanctuary model, more elephants will remain captive for exploitation. The only real sanctuary elephants have are wild places free from human interaction. As tourists, the better choice is to support wild elephant reserves such as Huai Kha Khaeng Wildlife Reserve in Thailand. You may not be able to go up and touch an elephant but that is the point - touching, bathing, and playing with elephants requires them to be caught, tortured, and tamed. The best interaction we can have with elephants is no interaction at all. Elephant sanctuaries in Thailand are glorified petting zoos, not sanctuaries. Though it is amazing and thrilling to pet and feed elephants (we had a wonderful time), we need to take the time to think about the welfare of elephants instead of our entertainment. As eco-friendly travelers and animal activists, we feel its important to share with you why you should not pay for a sanctuary experience as we did. We will never do one again or recommend them to our followers. Do the same, spread the message about unethical elephant sanctuaries and support wild reserves that aim to free and reintegrate captive elephants back into their homes. If you want to see what we did at the Maerim Elephant Sanctuary read A Day at Maerim Elephant Sanctuary or watch the video. The elephants were a fantastic experience, but hands down the highlight of our trip was the boat tour around Ayutthaya. Have you been to an elephant sanctuary? Does this article make you second guess elephant welfare and captivity at sanctuaries? Enjoy our content? Sign up for our weekly newsletter! We share freelance hacks, digital nomad insights, and budget travel tips. Thank you for subscribing! You will receive a follow up email shortly.